If you're heading to sunny Spain on your summer holidays, or even if you're not, there's a bit of prep you can do in advance. Spanish Wine Week started yesterday, so it's well worth checking out the wine tastings, dinners, talks and trails that are running throughout the country. 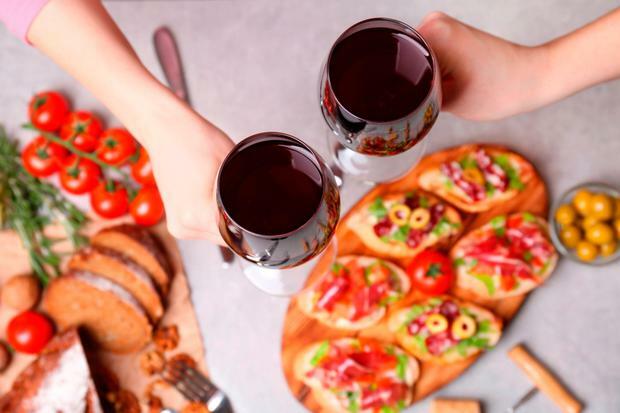 I'm sure you won't be surprised to learn that Spanish wine is one of the country's top favourites - clocking in at number four - and this is probably because when it comes to styles, there really seems to be one for everyone in the audience. Over the years, we've become familiar with Cava, the fresh style of Albariño, and the perfect all-rounder Rioja. A region you may be less familiar with is Ribera del Duero, but you'll definitely be well acquainted with one of the main grape varieties grown there, which is Tempranillo, the dominant grape used in red Rioja. Locally, it's known as Tinto Fino or Tinto del País. Ribera del Duero is about one and a half hours' drive north of Madrid, so as you can imagine, it's pretty hot. To counter this, the vineyards are typically located on cooler slopes at altitudes that range from 700m to 1,000m. But still, the grapes here struggle. It is a climate of extremes. Temperatures drop below zero in the winter, sometimes with snow, and in the summer, they climb to 38˚C, dropping dramatically at night to about 15˚C. Added to that, the stony terroir makes propagation even more difficult. As Antonio Diez Martín of Martín Berdugo wines joked when he was hosting a wine tasting evening in Green Man Wines recently: "The soil is so poor, even the weeds can't grow there. The only things that can survive are the vines." What this means is that the grapes develop a thicker skin, bringing an intensity of colour, flavour and aroma which adds to the body and structure of these wines. They are typically complex, with rich bold flavours, but, as I discovered from Antonio's tasting, wines made from the one grape variety can be very different depending on the soil they are grown in and how long the wine has been aged. I've included one of Antonio's bottles in this week's line-up (below), and if you're interested in joining me for one of the Spanish Wine Week's events, a sparkling wine tasting and lunch in Suesey Street restaurant and wine bar in Dublin next Saturday (April 28), it will be one of the two wines featured at lunch, after we've tasted our way through a selection of sparkling wines, including three very special Cavas. Not bad for €35. Other events for the week include a seafood and wine tour in Dublin on Monday, April 23, which will pair wines from the Rías Baxias region with seafood dishes from Klaw, €75. Also on Monday, in Pickle on Camden Street wine writer John Wilson will match Spanish wines with a dinner of North Indian food at 6.30pm, €55. On Tuesday, wine writer Tomás Clancy will host a tasting of his Top Summer Spanish Wines at Whelehans Wines at 7.15pm, €25. In Cork, also on Tuesday, Rafael Salazar of Vinostito will be pairing tapas with Spanish wine in L'Atitude 51 at 7.30pm, €15. On Wednesday, the Instituto Cervantes in Dublin will hold a Fino tasting at 6.30pm, €5. And on Thursday, sommelier Ian Brosnan will host a Cava and Canapés tasting at Ely Bar & Grill, €40. In Galway on Friday, head to Thomas Woodberry Wines in Galway for a free wine tasting at 8pm. Find out about more events, including wine and tapas tours by Gaby Guedez at spanishwineweek.ie. An elegant, very poised Albariño, this comes from the coastal Val do Salnés sub-region of Rias Baixas, so you get wet stone minerality and a whisper of salt balancing out the acidity and restrained apricot and grapefruit flavours. Beautiful with fish and seafood. Xarel-lo, one of the grapes used in Cava, is hugely on trend. This has fresh flavours of crunchy apple and peach with a crisp note of grapefruit and a brush of chalk on the finish. There’s a freshness and pure fruit quality to this vibrant wine. Flavours of blackberry, bramble and cherry, with polished tannins, warm notes of vanilla and a touch of toast.